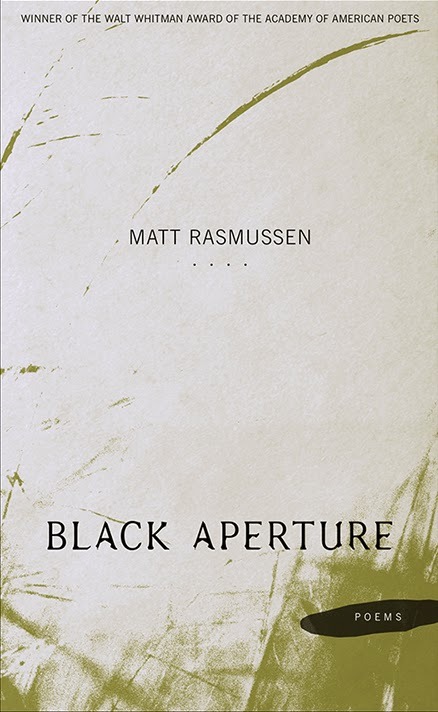 Matt Rasmussen’s superb volume of poems won the prestigious Walt Whitman Award in 2012. No doubt he had some worthy competition, but this book surely marks the entrance to American Letters by a young poet we will hear a good bit more from. Black Aperture was selected in the 2012 competition by Jane Hirshfield, herself one of the very best poets, writers, and teachers active today. This is a dark book. The title Black Aperture—the opening to a gun barrel—gives the reader a generous clue as to the tone. It is, however, unmistakably a brilliant work, as well. Layout and imagery work in firm agreement with the mood, the short poems of short lines cascading down the page like a vital sluice gate opened. Just whose death the poems signify will quickly be made known to the reader. What is released cannot be kept back. The energy is palpable. wrapped up in its coiled cord. of grass become a chime, pealing. like ash through a glass of water. under a large empty page. to get gas I look at my hands. kids build a man out of snow. I am reminded, of course, of the brilliant poet Greg Orr’s personal loss, of his life-long work dealing, as he must, with his own brother’s death—a hunting accident. Some images, some dreams, nightmares, and moments of déjà vu, have embedded themselves deeply into our creative unconsciousness. They are tenacious. They need not be particularly long. They do the work they must do, like a quick snowfall when the temperatures and precipitation are right. Here it is, again and again. Year in and year out. The recall itself, for the poet, like the recoil from a handgun, has power we will never measure. How could we? We can only attempt to write about it in order, perhaps, to better understand that it is real. Arthur McMaster‘s poems have appeared in such journals as North American Review, Poetry East, Southwest Review, Rhino, and Subtropics, with one Pushcart nomination. He has two published chapbooks, the first having been selected by the South Carolina Arts Commission’s Poetry Initiative. He also has a memoir, Need to Know: Journey of an American Intelligence Officer to College Professor and Poet. Arthur teaches creative writing (poetry and fiction) and American literature, at Converse College, in Spartanburg. Visit his website at http://arthurmcmaster.com.